.....for all the information on our guided walking, trekking and scrambling holidays in the unspoilt Picos de Europa mountains of Northern Spain with the Picos experts. Plus trip reports, weather forecasts, the Picos Blog and more. 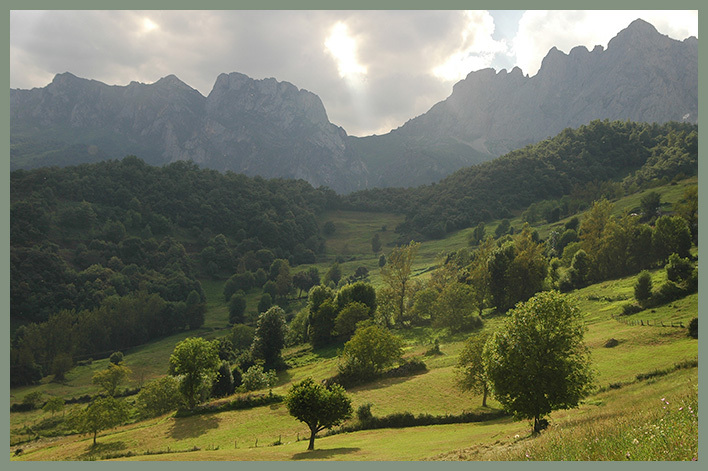 From ambling through shady woods and flower-strewn meadows, trekking the Scottish Highland-like Cordillera Cantabrica to scrambling on high limestone peaks, the Picos de Europa have something to suit every level of walker. Our intimate knowledge of both the high and low terrain is probably unsurpassed. 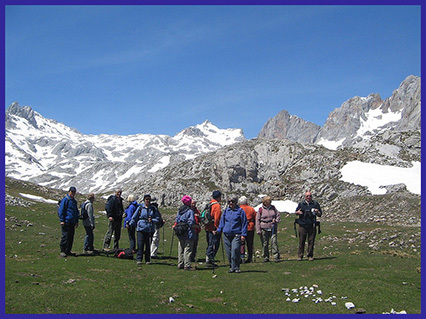 Year-round walking is possible due to the temperate climate enjoyed here. In the heat of summer there are always "fuentes" (natural springs) from which to fill your water bottles. In winter there is still warmth in the sun, however, as with all mountain areas, experienced walkers not using Mike's services must be aware of the possibilities of sudden changes in the weather and be suitably prepared. We take no responsibility for independent winter excursions. Mike, your guide, is a fully-qualified Mountain Leader. 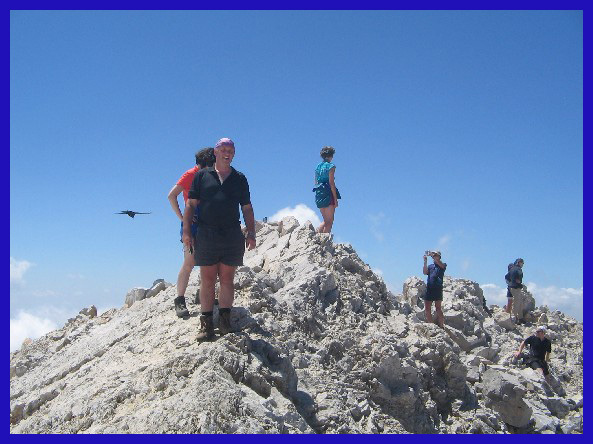 With his extensive experience of walking in the Picos (and his sense of humour) you are assured of enjoyable, rewarding days out on the hill reaching places you probably wouldn't get to on your own. We offer complete weeks, or just days, of guided walking at realistic and reasonable prices from April/May through to November. 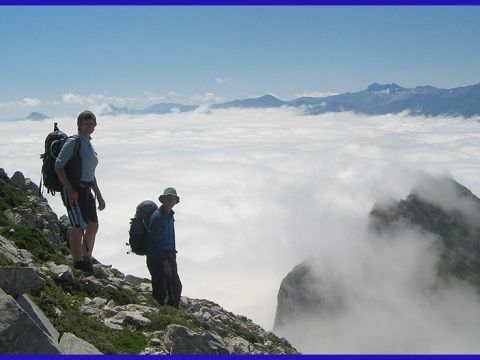 The price includes six days of guided walking and seven nights full-board accommodation with packed lunches of local produce - cheeses, sausages, fruit and goodies. You just bring stout boots, suitable clothing and/or a flask or water bottle. We have two different grades of walking weeks. Itineraries are flexible to allow for weather conditions and group/personal expectations. Passing through flora-rich meadows, full of vibrant colour and buzzing insect life, on ancient, time-worn paths, these walks are fairly gentle. Most days have more descent (max. 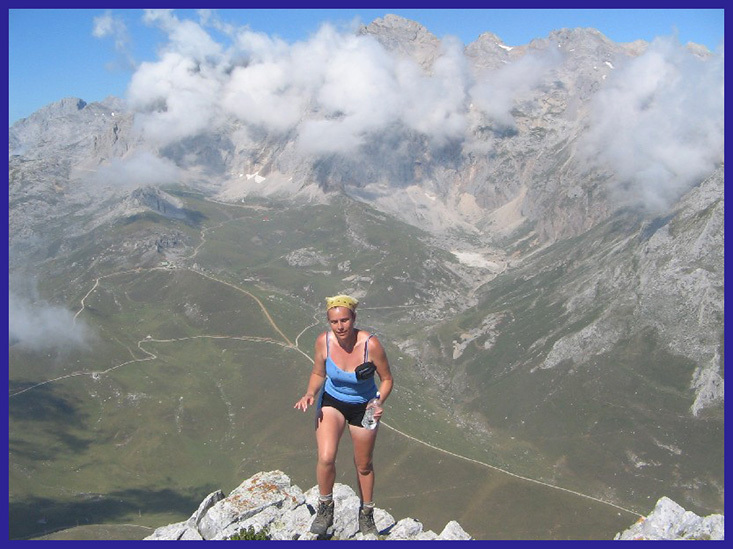 1300m) than ascent (max. 500m). A reasonable level of fitness required to enjoy four to six hours of walking daily. See below for an example walk. Exciting and challenging days, scaling the peaks of the Picos de Europa or traversing the ridges of the Cordillera Cantabrica. 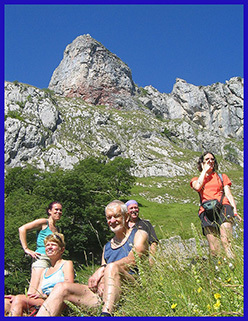 Days may involve easy scrambling with ascents and descents of up to 1300m. 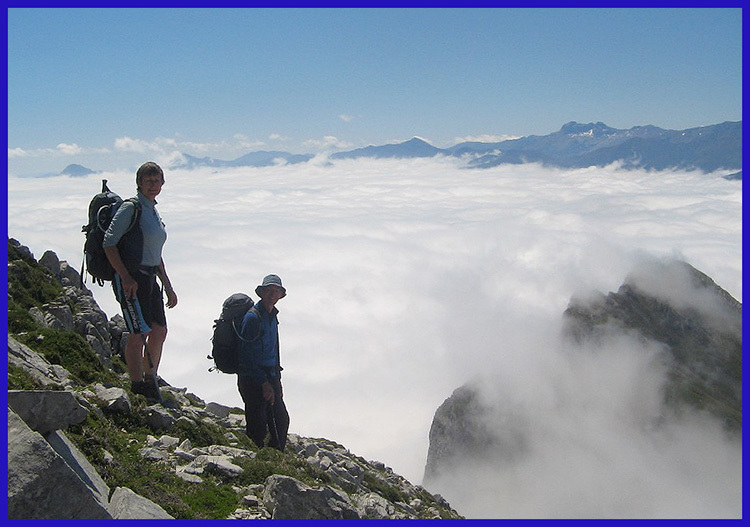 A reasonably high level of mountain fitness is recommended for these treks. Six to nine hours walking daily. A ten minute drive takes us to the village of Cobeña in the neighbouring Bedoya valley. 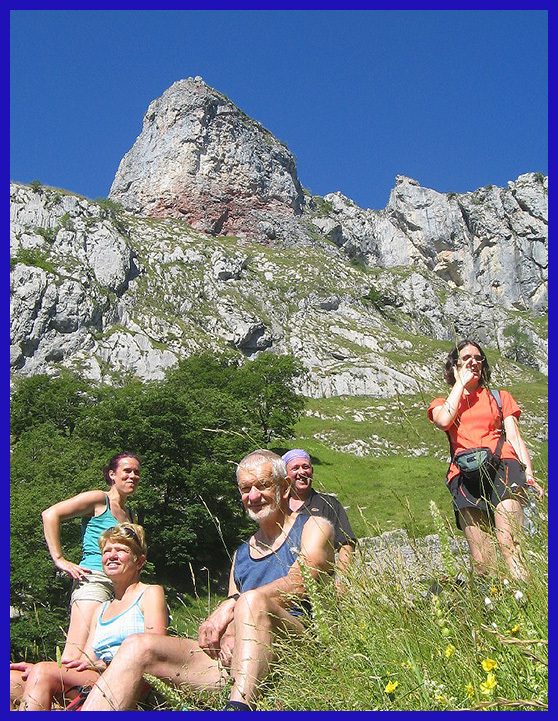 Within minutes of starting our walk, we are treated to great views down into the Desfiladero (gorge) de La Hermida and across to the impressive rock walls of Agero. Our route follows a track through ancient, mature holm oaks, between the white limestone and fields of Cobeña. From the col at approximately 900m, our way ambles and undulates between the hay meadows and scrub of Peña Ventosa. 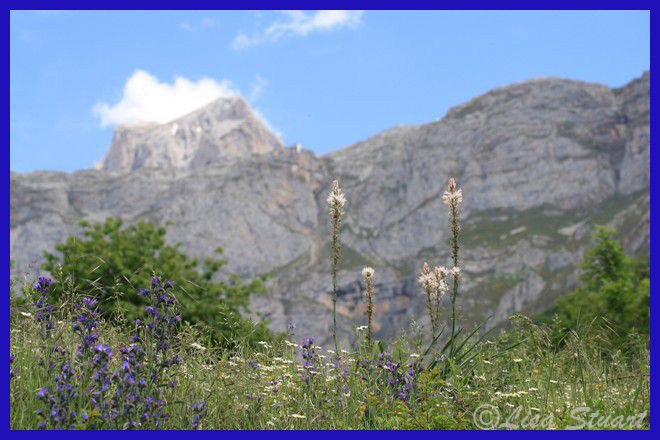 This is an especially rich habitat full of flowers, butterflies and birdlife, so makes an excellent spot for lunch. Resuming our walk, after a couple of kilometres of slowly rising traverse, our route gently descends into the Pyrenean oaks of Salarzón. After admiring the neoclassical architecture of the church, we carry on gently descending through meadows and vineyards. After the village of Trillayo, a short climb brings us to a hermitage, La Hermita de Nuestra Señora de Guadalupe. A further fifteen minutes of gradual descent through vines and pines, and along pretty country lanes brings us home to Casa Gustavo and a cup of tea or a beer! A twenty five minute drive takes us to the base of the cable car at Fuente De. A swift five minute ride brings us to its top station and home of the remarkably bold rebeco (the endemic chamois), Griffon vultures, Alpine choughs and Wallcreepers to name but a few. 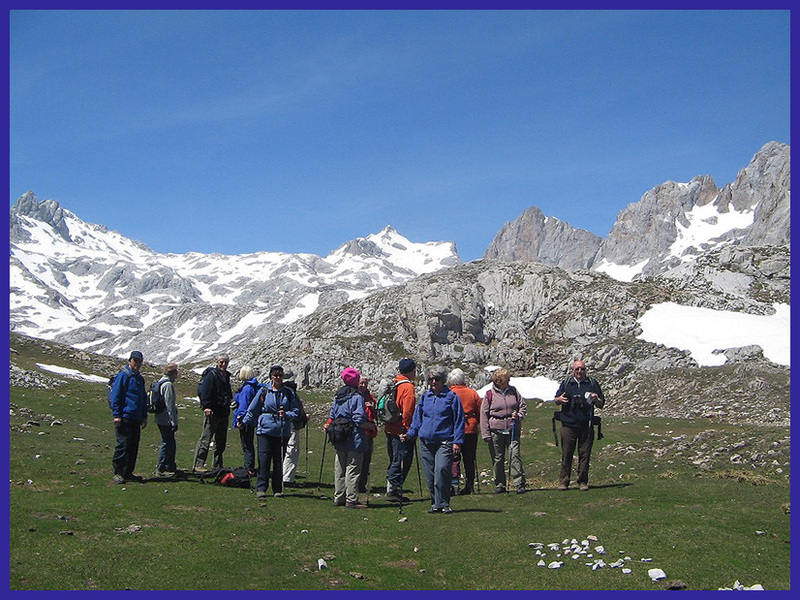 Walking into the lunar-like landscape of the central massif of the Picos de Europa, we head towards the Covarrobres col. Our track leads over a scree slope, under Peña Olvidada's (forgotten peak) and Peña Vieja's (old peak) impressive east faces. The route takes us past the now abandoned lead mines, closed in 1974, and up the Canal de Vidreos. 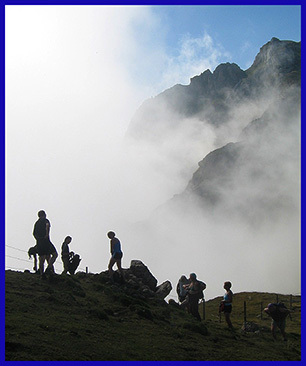 Whilst scrambling on this route is not a necessity, it is possible to indulge, at will, for the nearly 600m of ascent. Arriving at the summit we feel priviledged to enjoy the 360 degree views of the Picos and, if we're lucky, the Cantabrian Sea in the distance. Time for lunch. Our descent is via the Collado de Canalona down into La Vueltona, traversing another scree slope. We are now onto the main track leading back to the cable car. Please click here to email Lisa and Mike for dates, availability and general enquiries. 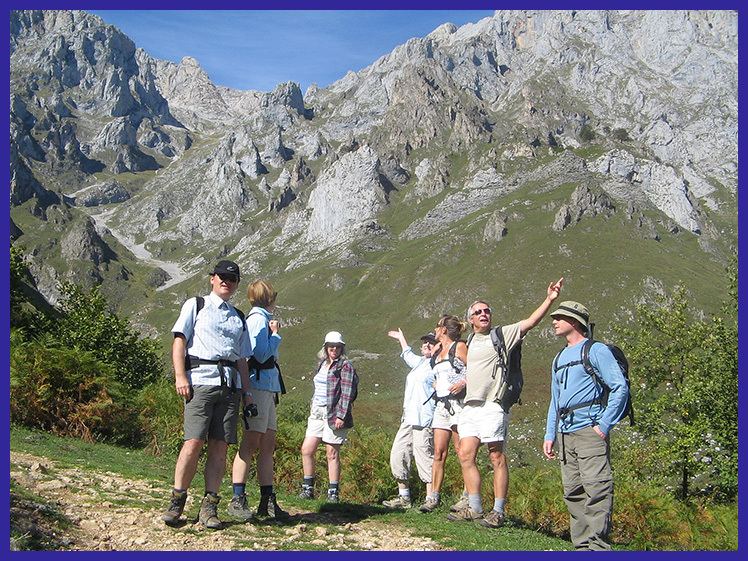 Martin Hunt regularly organises popular walking holidays in the Picos de Europa mountains with us. 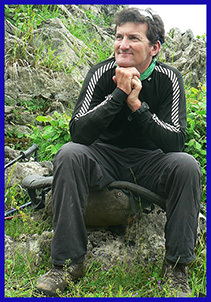 Based in Cornwall, Martin leads holidays all over the world. Visit his website Adventureline for more information on this trip which, if the others are anything to go by, will be a jolly affair and, as always, guided by Mike. whether to do walk number three or number seven!